Spleen - Hyperplasia, Mast cell in a female B6C3F1/N mouse from a chronic study. 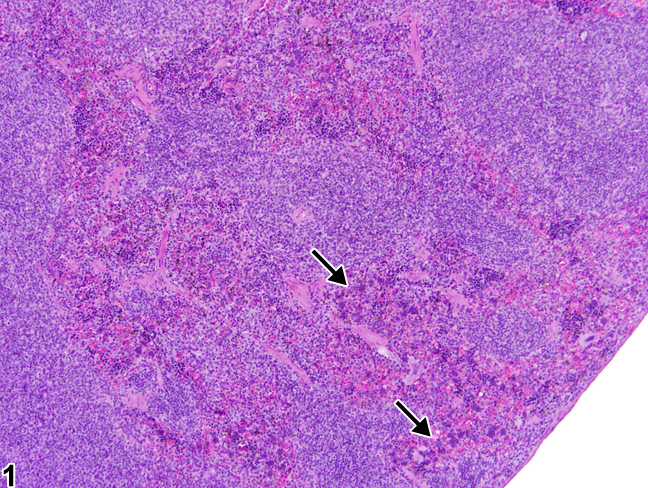 Multifocal aggregates of mast cells (arrows) are present within the splenic red pulp. Spleen - Hyperplasia, Mast cell in a female B6C3F1/N mouse from a chronic study (higher magnification of Figure 1). 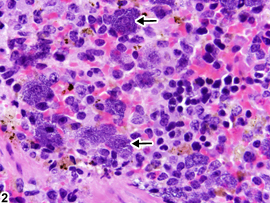 Clusters of well-differentiated mast cells (arrows) are intermixed with other red pulp cellular components. 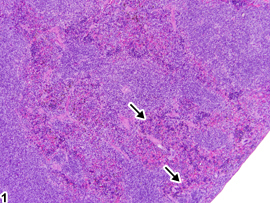 Mast cell hyperplasia can be seen within the spleen of rodents. This lesion is characterized by loose aggregates of well-differentiated mast cells within the splenic red pulp that are not associated with inflammation. Mast cells are relatively large cells with abundant cytoplasm and typically have numerous densely basophilic intracytoplasmic granules that may obscure the nucleus ( Figure 1 and Figure 2 , arrows), although they may also present with prominent pale basophilic cytoplasm and less apparent granules. Mast cell hyperplasia must be differentiated from metastatic mast cell tumors. Mast cells within the spleen in the absence of a primary mast cell tumor are supportive of a hyperplastic rather than a neoplastic lesion. Whenever present, mast cell hyperplasia of the spleen should be diagnosed and assigned a severity grade. National Toxicology Program. 2005. NTP TR-513. Toxicology and Carcinogenesis Studies of Decalin (CAS No. 91-7-8) in F344/N Rats and B6C3F1 Mice (Feed Studies). NTP, Research Triangle Park, NC.